I consider myself somewhat hard to please especially when it comes to going out and recreation (DON’T JUDGE ME lol). This is because I find it quite cheesy and boring to always go to places I’ve always been and do the things I’ve already done repeatedly… maybe just in a different place but hey if I’m going to be doing the same thing, I’d just quickly sink into boredom. What makes things more interesting is exploring things whose outcome is totally unpredictable…that’s where the excitement lies (in my opinion of course). When it comes to eating out, exploring and pushing yourself beyond what you find comfortable can be a very interesting thing to engage in and if you haven’t tried it, I’d highly recommend it. although I cannot always guarantee a happy ending, you’d have a good laugh every here and there and of course some good memories too. My first sushi experience was suggested by a friend of mine in uni and I must say she’s also quite the adventurous kind. Believe me when I say sushi is one of the most eye pleasing dish arrangements I’ve seen and I’m sure you’d agree with me after seeing the pictures here but we all know that the aesthetics of a meal and its taste can be two worlds apart. Again, I’d like to say this is only my view on sushi and is totally subjective. Well, it was a Japanese restaurant with excellent aesthetics and a very relaxed atmosphere, BUT I have no idea how to use chopsticks…and neither did my brother and my friend LOL. Well after several minutes of fooling around, we requested conventional cutlery. Getting into the dish now… a closer look at the beauty in front of me, 90% of what I had on my plate was totally raw!! Yes, it was uncooked fish and some other seafood whose names I’m not sure I can remember. I think the only thing that was cooked on my plate was the rice. Because I’m used to having all my meals properly cooked, it took a whole lot of courage to get raw fish in my mouth. About how it tasted, I wouldn’t know if I’d say it tasted bad, but it sure felt so weird and bizarre in my mouth… probably cos it was my first-time experimenting stuff like this. Well, I threw in the towel after a couple of more attempts and so many laughs then ended up ordering a bowl of yummy noodles to compensate because I came hungry for a feast lol. 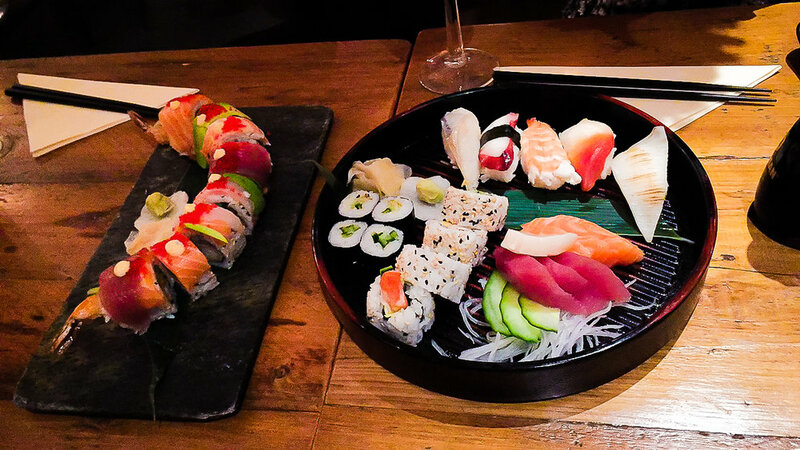 In my opinion, sushi is a great delicacy… its not just for everyone! Eating out as a form of recreation can get very cheesy and somewhat boring especially when you get to repeat the same vicious cycle all the time. Trying out “the wild things” would be a breath of fresh air for you if you share this same view with me and I look forward to trying more “strange things (maybe an octopus)” and sharing with you guys.